Ask any diner diver or galloping gourmet, and they’ll tell you that if you want to find the best breakfast in town, just follow the locals! It’s no wonder that FLYING SAUCER RESTAURANT has been voted Niagara’s Best Breakfast! Our menu is loaded with a stellar selection of old favourites and tasty new temptations to satisfy hungry Niagara Falls families and weary intergalactic travelers alike. We’re famous for our great prices too! Blast off with our Early Bird special – Niagara Falls best breakfast deal – served from 6am til 10am. Hot, fresh breakfast delivery is available .. every day, anywhere in town. Now THAT’S room service! 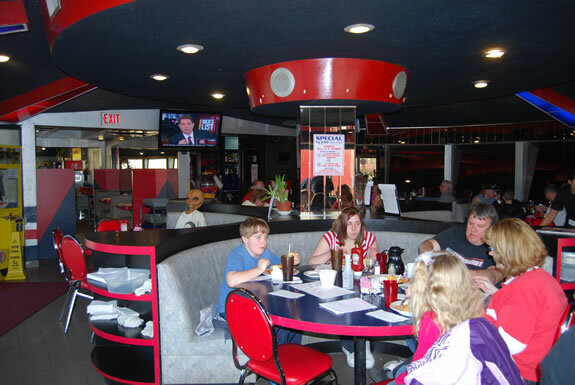 When Niagara Falls’ locals vote our breakfast number one.. you know it’s got to be great! FLYING SAUCER RESTAURANT is known throughout the galaxy for OUT OF THE WORLD food at DOWN TO EARTH PRICES – served at the speed of light!